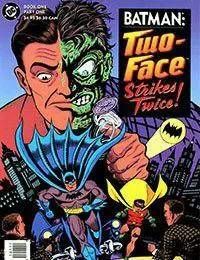 Many times has the tragic and sinister shadow of Two-Face loomed across Gotham City, challenging the forces of law and order, and always has he been repelled by Batman and Robin! But now the Duke of Duality has a partner of his own! Watch the Dynamic Duo attempt to fathom his devious plot... In The Two Faces of Janus!